Andrew Williamson is a Toronto-based professional photographer and the owner of Blackcat Artspace— a growing hub for the arts in the Dundas West neighbourhood. He’s been a connecter of creative people for a long time and has already hosted three Artery showcases in his home - with the first taking place one month after purchase. In fact, he turned his new home over to a group of dancers before he had spent a single night under its roof. He sees his home and gallery as evolving projects - with every show he hosts, his space changes along with it. We caught up with Andrew, in his still-being-renovated living room, to learn more about his journey and what got him hosting in the first place. I run my own business as a professional photographer. I also run an art gallery, the Blackcat Artspace on Dundas West. It’s a small storefront that I took over and renovated and I’ve also been hosting Artery shows in my living room. How did you come up with the name “Blackcat”? The Black Cat was a beautiful 100-year-old building that used to be a cigarette shop with amazing stained-glass windows, and hand-painted signs of what it once was as a smoke shop. At shows, I’d start shining a light behind the signs and people had this ethereal experience and didn’t know where they were so they just started organically naming it, and the gallery’s name took on a life of its own as the Black Cat Artspace. Tell us about growing up in Toronto. "This Is Our Place" showcase: a mini dance residency within a residence hosted by Andrew in his Junction area home. I grew up in the suburbs [of Toronto] which was a decent place to grow up, but culturally, there was not as much to do. I was always drawn to the city. I would get on the GO Train and just head downtown. I was always into the arts and ended up studying photography at Ryerson. When I graduated I moved into this raw warehouse that used to be a fur factory, along with some other photographers and artists. We started throwing art shows and ran a cash bar to pay the rent. That’s where I started hosting shows. What was the creative inspiration behind that first show in the warehouse? Across the hall there was a guy named Jeff that hosted a show once every two weeks. It was called the “Fire Escape Sessions” where he’d literally host a musician on the fire escape between our two units. It was this New York-style fire escape that looked really good. So, I sort of stumbled in on this and he asked me to join the project as a photographer. Through that I realized I didn’t just want to show my own work, I was interested in curating other people’s work and collaborating. I’m not particularly good at anything in the arts, but I’m good at connecting people and making things happen. So when did you decide to become a host on Artery? When I first bought my home, and got the keys! I had a lot of work to finish and before I could even look at the place, I was talking to my friend who’s a choreographer, and she told me “when you get this house, I want to do a dance residency.” The moment I walked in and saw the place, I handed her the keys and she and her company took up residence for about a week and created a unique, immersive performance in each room. At the end of that week we had 50 people come for the showcase and we split them into different groups to see each performance. The house wasn’t even renovated. One room had blue carpet, and so that performance was based on the colour blue. One performance was based on the wallpaper in the room. Everything culminated in the living room and I’ve been hosting something almost every month, ever since. What would you say to people who are thinking of becoming potential hosts? Know that people who are interested in coming to events like this are just awesome. They’re very respectful. You can test the waters by going to an Artery showcase first, and see how different hosts set it up. Make sure that there’s a break and/or intermission in the performance. Chances are when you’re leaving your house and coming to an event like this, you’re going to meet someone new and interesting. When you provide a break, it gives people a chance to talk. One thing that works well in my gallery is that it’s so small. You have to interact with other people and hear their stories. As someone that regularly opens up both your work and personal spaces to performance, why do you think this is important? Over the past ten years, its been so rare to find spaces that are affordable in Toronto. As economics push art out, we have to be more resourceful. We need to use our garages, our lofts, our backyards. I think Artery is great because it allows people to use the space that they already have and be participants in the arts. When you open up your doors, people want to reach out to you. If opportunity doesn’t knock, build a door. 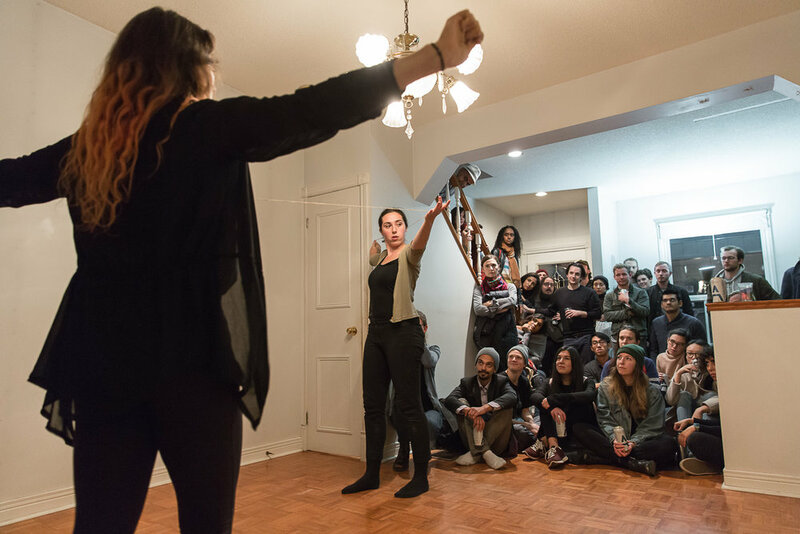 By hosting an Artery showcase, you bring great people to your home. Andrew's fourth Artery showcase, and first in his Blackcat Artspace, is happening on Sunday, April 22, 2018. Grab your spot here.